I’ve come to realize that this is a difficult time of year to be writing a macro photography blog. When I first started this blog I had a reasonable backlog of photos and stories to draw on. Plus during the summer I could spend a couple of hours outside in the field and have material for several blogs. But my backlog of digital images was quickly depleted (for the first 30 days I attempted to post every day) and as I write this it is pouring rain outside and the temperature is hovering around 6 degrees Celsius. Needless to say, finding critters to photograph has become a real challenge. I went out to the garden yesterday and had a look around and all I could find were earthworms. For the next few months I’m going to have to concentrate on photographing specimens in my “studio” (my kitchen table). One of the techniques I’ve been meaning to get back to playing around with is image stacking. The last time I tried my hand at image stacking was way back in August (see More image stacking: portraits of flies). 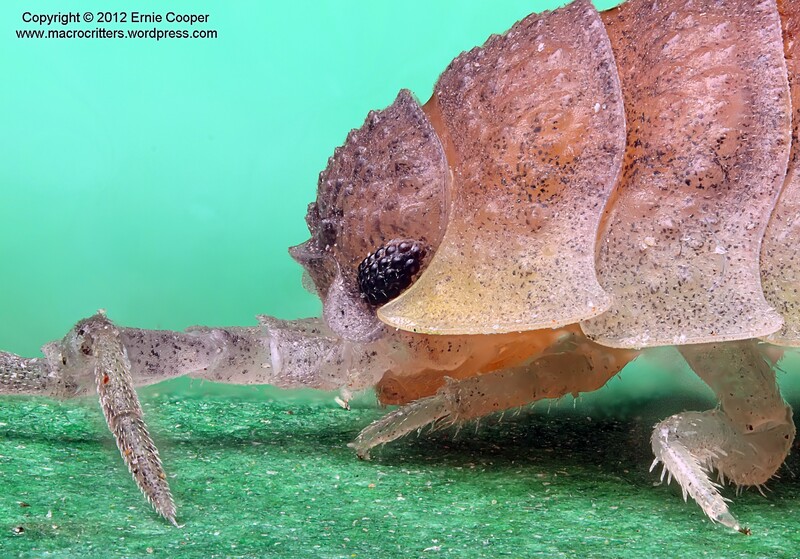 So the other day I set-up my vintage Olympus bellows and Zuiko 50mm lens and took another stab at the technique (see Image stacking revisited: macro photograph a sow bug—take 2 for a description of my equipment). 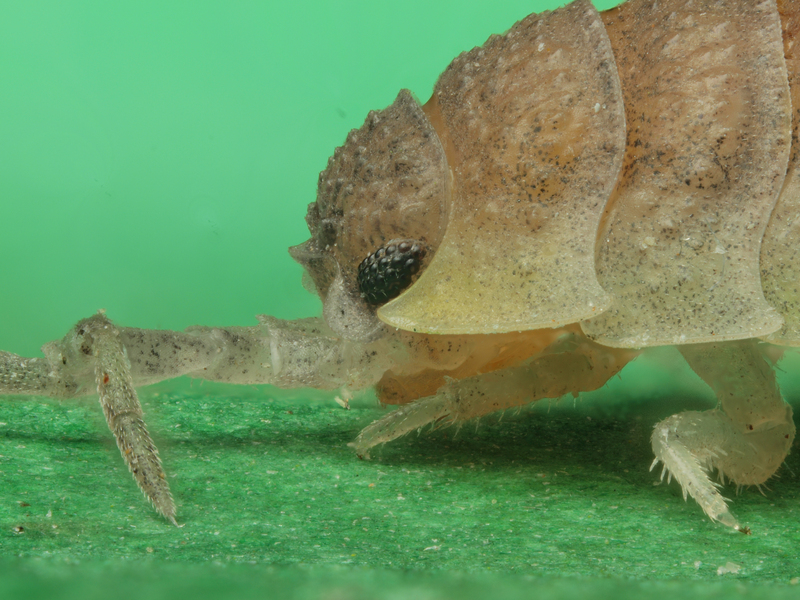 The result was the picture above: a side-view of the head of a common sow bug or woodlouse (order Isopoda) created from a stack of 57 separate images. Unfortunately I am not at all thrilled with this photo. The animal itself is cool (it looks like it is wearing medieval armour), but the photo just isn’t crisp enough…and this is the edited version! I had completely forgotten how finicky and time consuming the process is. It took me hours to finally get the images, run them through the software (Zerene stacking) and edit the final stacked image. The original version of the stacked photo is shown below. As you can see, it is pretty rough. The final version is the result of a lot of processing in Photoshop Elements: I adjusted the brightness, contrast and colour, and sharpened it both under the “Enhance” tab, and by doing an aggressive high-pass filter (see I’m not lion: this is a fishy story for an explanation of this technique). Although my technique still needs improvement, I think the main challenges are the limitations imposed by my equipment. I don’t think my trusty old Zuiko 50mm is sharp enough for this work. It doesn’t help that I had to shoot the initial images with the lens stopped to F8. The lens is sharper at F5.6, but the depth of field at F5.6 is so shallow, that I have trouble adjusting the focus (using the bellows focussing rail) in tiny enough increments to catch every fine detail of the specimen. I guess it’s time to invest in more equipment. Last summer I was able to track down an Olympus PM-MTOB adaptor (from the 1970s, still new in the box) for attaching a microscope objective to the bellows. I have a number of microscope objectives kicking around, but none of them are suitable for this purpose. So today I ordered a new 4x objective that should work well and hopefully provide better image resolution. I also ordered a used Zeiss Microscope Focus Arm off of EBay: the Focus Arm is the piece of the microscope that includes the fine focus adjustment mechanism. I’m hoping that I can use the Focus Arm to build some sort of Rube Goldberg inspired macro stand that will allow me to adjust the focus in small enough increments. If it works I’ll start considering other higher magnification lenses. Thank you! I missed the Canadian Thanksgiving this year because I was in Mexico. Not exactly a hardship, but I did miss my turkey dinner! All the more reason to eat extra at Christmas! Looking forward to what you come up with. I have not ventured into as close of work as you and am looking forward to you getting even closer. I too am finding insects a bit sparse at this time of year, but my next post has a grasshopper in mid November. We are now in the thirties so I bet nothing is out there at this point.